It can be confusing when looking at waterproof jackets or coats with different price tags to know what you are actually getting for your money, whether a cheaper or budget waterproof coat is going to be suitable or whether it is worth investing in a more expensive beating or shooting waterproof coat. Waterproof and breathable membranes, DWR, water repellent coatings, taped seams, drop liners…it can all get a little confusing. So what does it all mean? 2. Coats which are only waterproof to the extent of showerproof as they may only have a fabric that has been treated to be water repellent. The hydrostatic head test consists of the fabric being held taught; a 1 inch diameter tube containing water placed on it and tested over 24 hours to see how many millimetres of water the fabric can cope with before leaking. In order to be declared waterproof, jackets must have a hydrostatic head of 1,500mm to comply with British standards. However this doesn’t necessarily mean it will keep you dry all day long in the heaviest of downpours. At the end of this guide is a table to help you choose your waterproof coat. Why is a coat being breathable important? Breathable means that it lets moisture out of the jacket. If not, as you get warm and perspire, this can lead to condensation within the coat and a feeling of wetness. Some people mistake this as their coat having leaked and let water in and not being waterproof, rather than realising that the coat is waterproof, but just not breathable and therefore the water is from the wearer on the inside, not the outside! DWR stands for Durable Water Repellent. This is a coating applied to fabric which repels water, causing it to bead and run off the fabric rather than soaking in (which can affect the breathability of the fabric). As it is a coating, this can breakdown over time through repeated washings, chemicals or salts or quite simply good old fashioned wear and tear. You can test whether the DWR on your jacket has broken down. Simply flick or sprinkle water on the jacket. If it beads then and rolls then the coating is intact. If it soaks in, the coating has broken down. If it has broken down, the good news is that there are products on the market that can be applied at home. Some manufacturers recommend certain products so it is worth checking. Hoggs of Fife use Telfon™ coatings for rain and stain resistance, often in conjunction with a waterproof membrane and taped seams. Toggi also use DWR, again often in conjunction with a waterproof and breathable membrane and taped seams. This is when on the inside of the seam (where it can’t be seen), waterproof tape or a liquid sealant is applied to prevent water getting in through the seams. The term waterproof drop liner indicates that the lower section of the lining fabric is made water resistant so if any water get under the hem of the jacket it will remain dry. GORE-TEX® has been favoured by Musto since 1994 and is also used by Harkila. Although not the cheapest, it is the “Rolls Royce” of membranes and this is one of the best options on the market for ensuring you stay dry in all weathers and a worthwhile investment, especially if you go beating or shooting regularly. SEETEX® is a specialist waterproof and breathable membrane developed by Seeland which has a hydrostatic head of 10,000mm. Seeland use this in conjunction with taped seams in their shooting jackets and beating coats. 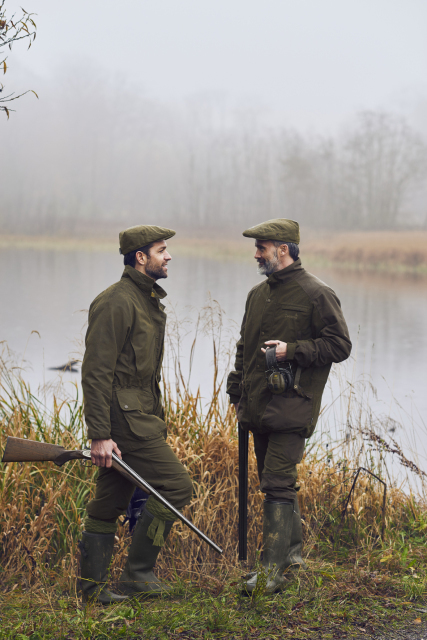 Prooftex™ is the waterproof, windproof and breathable membrane favoured by Hoggs of Fife for their shooting coats, including waterproof tweed coats. This is a durable waterproof membrane made especially for Alan Paine. This is the windproof, waterproof and breathable membrane used by Deerhunter. Please note this guide has been produced as a guide only through information provided by the manufacturers for tests carried out in laboratory conditions; actual levels of waterproofing over time and use will also depend upon the care taken for the garment. Also, driving wind, heavy rain and outside pressure against the garment may also play a factor.